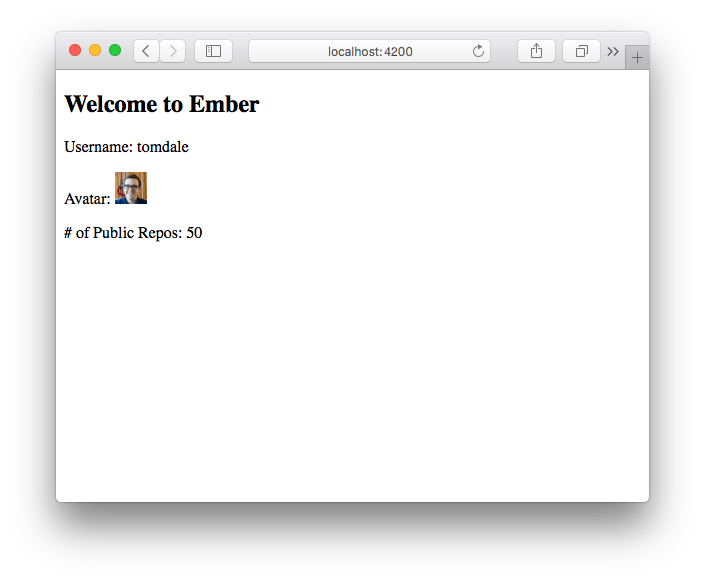 This quickstart guide will walk you through creating a simple Ember app that fetches data from GitHub, then renders it using FastBoot. To start, make sure you've got Node.js and npm installed. If you've never used Ember before, you may want to run through the Ember quickstart guide. Once created, cd into the github-fastboot-example directory. 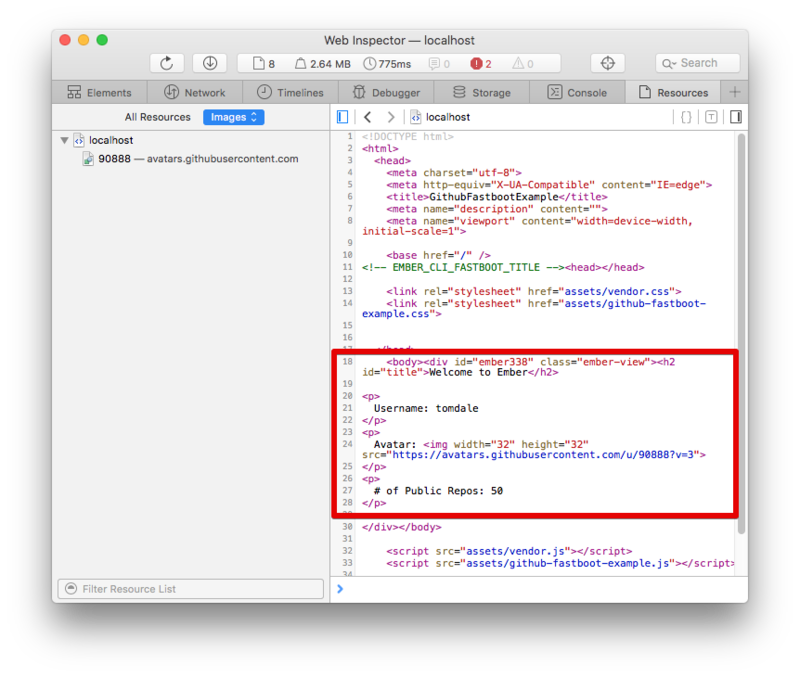 We need to fetch data from the GitHub API, but there's a small problem: the browser uses XMLHttpRequest to fetch JSON data, while in Node.js you'd use the http library. We'll be running the same Ember.js app in both environments, so we need some way of making it work in both. Let's install a tool that will let us write the same code whether our app is running in the browser or on the server. Code that runs in both places is sometimes called universal or isomorphic. Under the hood, the ember install command is just like npm install, but automatically saves the addon to your package.json file. In Ember, routes are objects responsible for fetching model data. Let's make a route that fetches information about you from GitHub. This will generate a new route called index. By convention, index is the name of the route for when the user visits the root path, or /. Think of it like index.html. Open the newly-created app/routes/index.js file in your code editor. Let's add a method called model() to the route that fetches information about your user from GitHub. We'll use the fetch polyfill exposed by the ember-fetch addon that lets us write universal fetching code for both the browser and Node.js. A polyfill is a library that provides a standardized API that isn't available in all environments yet. In this case, it's polyfilling the Fetch API. Implement the model hook like I did below. You might want to change the username in the URL from mine to yours. This runs a local development server you can use to verify your program is running correctly. Visit localhost:4200/ in your browser. You should see your GitHub profile rendered below a title that says "Welcome to Ember.js". We've verified we've got a working application, but there's one problem. 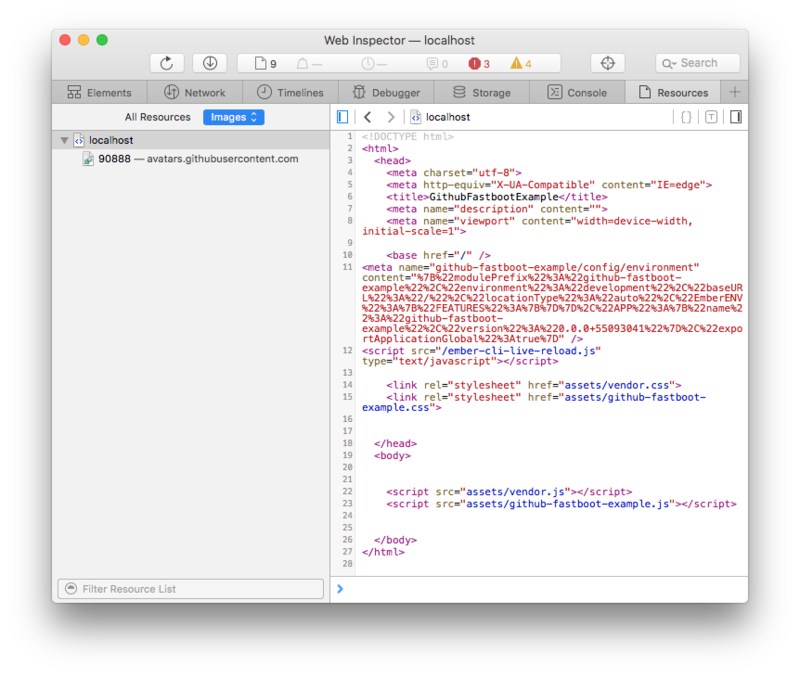 If you use your browser's View Source feature, you'll see that there's no HTML being rendered: just an empty body and some <script> tags. Let's fix that. Back in the terminal, stop the development server by hitting Ctrl-C on your keyboard. View the FastBoot-rendered content by visiting localhost:4200/. Note the same port! ember serve can serve render your app on server side as well. Moreover, all options of ember serve will work with FastBoot (example --proxy, --port etc). Everything should look just the same as before. The only difference is that, this time when you View Source, the <body> tag is populated with the rendered HTML content. Congratulations! You've just built your first FastBoot application. Now that you've got your first FastBoot app, it's time to start adding FastBoot to your existing apps. Or, learn how to deploy your new app by learning about Deploying. If your app is running ember-cli 2.12.0-beta.1 and above, you can now serve your FastBoot rendered content with ember serve as well.